These round-headed heavy duty screw posts are ideal for extra-heavy materials such as carpet samples. They are the strongest screwposts we carry. These heavy-duty screwposts are also useful for books that are in constant use or are often mistreated. These posts will stand up to rough treatment that would destroy lesser bindings. If you don't need the extra high strength, we recommend our standard steel screwposts or our industry standard aluminum screw posts. 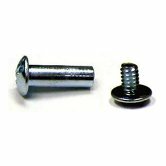 For a different look, please consider our plastic screw posts. The screws have a combo (slot and phillips) head. The post heads are slotted. 1/4 inch posts are threaded all the way through the post for added strength. All posts can be extended using the 1/2 inch extensions below.